Dear Students, IBPS SO(Specialist Officers) Prelims 2017 Online Examination (31st December 2017 - First slot) is over now. it was held from 9:00am(Reporting Time at the centre). Exam time was from 10am. 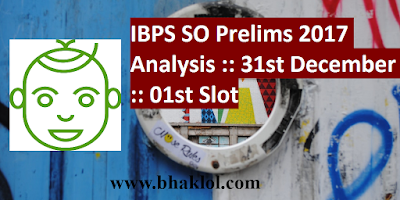 Now the time is to see the detailed exam analysis, Review, Good Attempts and Expected cutoff. We are sharing separate analysis of Law Officer and Rajbhasha Adhikari and IT Officer, Agriculture Field Officer, HR/Personnel Officer and Marketing Officer. 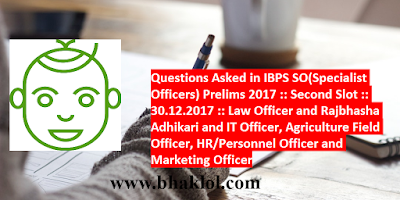 Dear Students, IBPS SO(Specialist Officers) Prelims 2017 Online Examination (31st December 2017 - First slot) is over now. it was held from 9:00am(Reporting Time at the centre). Exam time was from 10am to 12:00Noon. 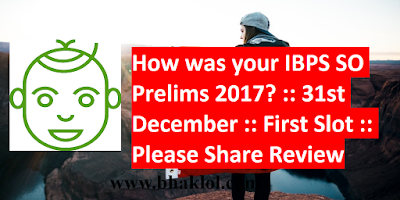 Now the students who took this examination , please share the review. 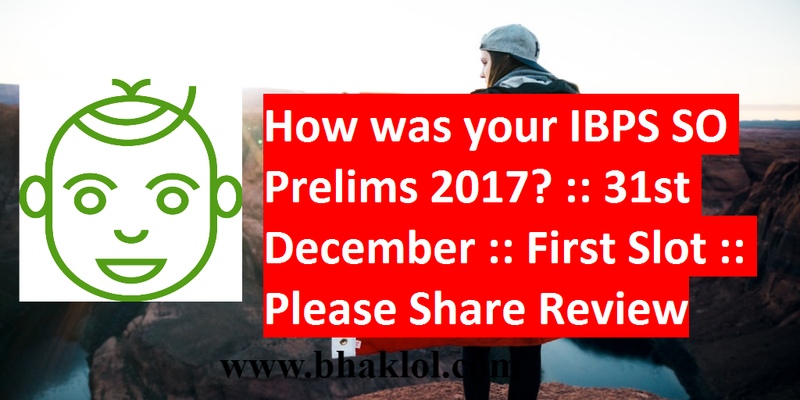 Dear Students, We are sharing memory based questions of IBPS SO(Specialist Officers) Prelims 2017 Online Examination (30th December 2017 - Second Shift). Dear Students, IBPS SO(Specialist Officers) Prelims 2017 Online Examination (30th December 2017 - Second slot) is over now. it was held from 1:00pm(Reporting Time at the centre). Exam time was from 2pm. Now the time is to see the detailed exam analysis, Review, Good Attempts and Expected cutoff. 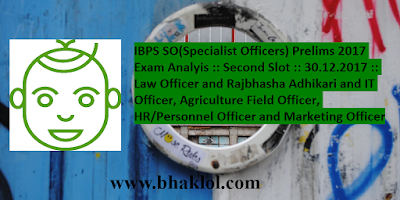 We are sharing separate analysis of Law Officer and Rajbhasha Adhikari and IT Officer, Agriculture Field Officer, HR/Personnel Officer and Marketing Officer. Second slot was almost same as first slot paper.